How do I configure the confirmation messages displayed to customers when they place an order? Navigate to Content > Message Editor > Order Confirmation E-Mail Message. Specify your desired message in the Order Confirmation E-Mail Message field. There are two editors to change and adjust the Order Confirmation Message displayed to customers who place a successful order. Go to Content > Message Editor > Custom Message on Order Confirmation Page. If you wish to display the order information on the order confirmation page, select the checkbox for Display Order Information on Order Confirmation Page. This setting also enables the customer to print their order. Go to Site Settings > Pay Methods. 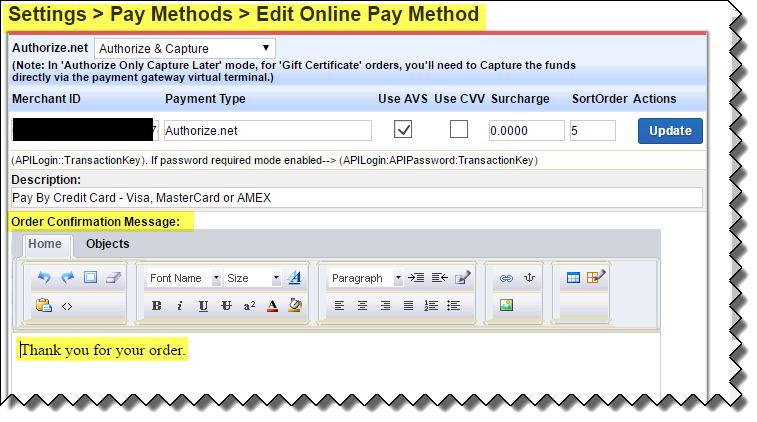 Select Edit for the Payment Method. Enter an Order Confirmation Message.